When television station CFPL in London first went on the air on November 28, 1953, it was just the second private broadcaster in Canada. It has now been in operation for over 50 years and has become an integral part of the cultural fabric of the London area, and a vital communications link throughout southwestern Ontario. In June of 2002, CFPL generously donated, to the Archives of Ontario, the entire news output for their first 15 years of operation. This material represents a time capsule that vividly illustrates life in the province half a century ago. Contained in the more than 2700 rolls of film is a rich tapestry of stories ranging from charming public interest events to devastating tragedies: from stories about Mother Nature flexing her muscles to the fortunes of the political figures of the times. It is a significant historical record documenting social and economic changes that profoundly shaped Ontario in the post-World War II era. And, it is a unique portrait of who we were. By placing this material in the care of the Archives of Ontario, CFPL has ensured that this collection will be preserved and available for generations to come - a tremendous gift to the people of Ontario. Mirror Mirror…. Looking Back Through the Eye of the CFPL News Camera is a virtual exhibit that celebrates that gift. It must be remembered that in the early days of broadcasting, there was no videotape. News stories were shot on film and the shows were broadcast live with the newscaster reading the script directly to air. So, there is no permanent complete record of the actual early broadcasts. The material that the station preserved includes the edited 16mm film of the news stories themselves, plus the scripts that the newscaster would have read during the broadcast. For this project, where appropriate, the Archives has recorded an actor reading the original script and married it to the original news footage to try and recreate the stories as closely as possible. In some cases the stories have been shortened or edited for clarity. However, every attempt has been made to insure the integrity of the information. We are fortunate that as part of their programming, CFPL created a show every year that recapped the year's events. For the purposes of this exhibit we have taken advantage of those shows as they have made it possible to cover more stories and broaden the material being presented. No project like this can be complete. We have set out to create an exhibit that captures the flavour of the times and a flavour of this wonderful collection. CFPL was started by Walter J. Blackburn, publisher of the London Free Press. 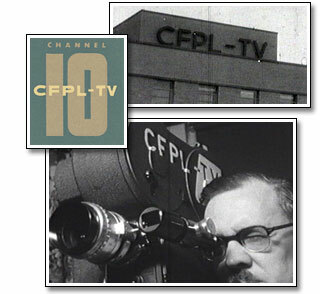 In fact, the call letters CFPL stood for “Free Press London.” The station started out as a CBC affiliate. The CBC television network itself had only started broadcasting two years earlier. On its first day of operation, there was a major fire in downtown London and CFPL was able to broadcast news of the fire to the community. The station was acquired by CHUM in 1997 and is now called the A-Channel. The original donation consisted of approximately 2700 reels of film and was accompanied by a very generous financial donation to cover the costs of cleaning and cataloguing the vast quantity of material. There has since been a further donation that includes the news footage for the years 1968 – 1978. Choose a year from the list to the right or at the bottom of every page to be taken to a page containing a selection of 10-12 CFPL news stories from that year. Click on the thumbnail images to view the videos. Note: The funding for this exhibit was provided by the “Ideas and Innovations Program” of the Ministry of Government Services.